TAKE US HWY 321N APPROXIMATELY 3 MILES FROM I-40. The Hickory Social Security office is located in Hickory 28601. The following page includes information for this location like the office phone number, hours of operation and driving directions. If you have any interests or comments about your retirement benefits or are interested in making an appointment, call the following Hickory Social Security office. The Hickory Social Security office is located in Hickory 28601. The following page provides information for this location like the office phone number, hours of operation and driving directions. 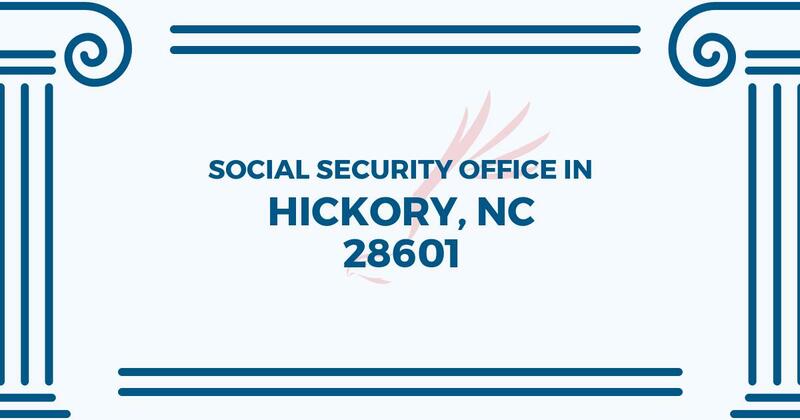 If you have any interests or comments about your Social Security benefits or are interested in arranging an appointment, call the following Hickory Social Security office. This office is AWESOME! I went in here nervous because of all the horror stories. Had to go here twice within a week because of a mistake on my behalf, and everyone there was super nice. No wait at all, very quick both times. Both gentlemen were super kind and patient, completely understanding. Would recommend this place over and over!! !